The River Dee has some beautiful rural towns positioned along its glorious riverbanks such as Banchory, Ballater & Braemar and the area between the latter two towns is known as Royal Deeside due to Queen Victoria's 'astutely' positioned Balmoral Castle which is located between these two picturesque towns. The River Dee fishing season commenced on the 1st of February and finishes on some beats as late as the 15th of October. This perfect Scottish fly fishing river has beautiful boulder strewn clear water pools that ebb & flow down through various glides and fast water rapids throughout it's entire length on route to greeting the North Sea in Aberdeen. The River Dee benefits from around 50 famous salmon beats throughout its entire length and during early season it is normal for perfect Spring salmon to be caught in its lower & middle river salmon fishing venues like Invery, Banchory & Lower Blackhall in and around the Banchory area. Salmon stocks continue to build up in the lower & middle River Dee throughout the Spring months until the river water warms during April & May when salmon run through to the upper Dee salmon fishing beats like the beautiful Crathie Beat near Ballater & Braemar. Good fishing is possible on the river at any time of the salmon fishing season and it always amazes me how many salmon are present in the Autumn months and while watching the river at that time of year it's not uncommon to see two salmon in the air at the same time! As I write this I note I see a few of the Dee beats are already in about the silverware now that the 2019 salmon fishing season is underway. In particular I see the beautiful Invery Beat at Banchory has already produced 2 fine Spring fish which does not surprise me at all given the sheer quality of varied salmon holding water this middle Dee salmon beat is fortunate to benefit from. The most appropriate fly fishing kit for the River Dee is a 14/15ft ft double handed salmon fly rod with a floating line and the occasional use of a sink tip when depth of fly is required. In low Summer water conditions a full floating line works well and in the higher water levels of early Spring a full intermediate line or a longer heavier sink tip added to a floating line are both perfect tactical fishing approaches. Popular Spring salmon flies are the Dee Monkey along with the Park Shrimp which both work well tied on either copper or aluminium tubes for the early months then moving onto single or double hooked versions for the later Spring months. Other salmon fly patterns that do well are the Ally's Shrimp, Sunray Shadow, Willie Gunn, Cascade, Flamethrower, Copperass & the Stoat's tail (or Silver Stoat). In lower Summer water conditions I've had good success with the smallest and most lightly dressed Stoat's Tail patterns which look like the tiniest of trout flies so don't fish a normal looking Summer salmon fly and if you can thread your leader through the eye of the salmon fly too easily then it's too big! The River Dee is a beautiful Scottish fly fishing river that will work her magic on you and the memories attained while enjoying her salmon fishing beauty will remain permanently in your mind encouraging you to return year after year as many of her 'spell bound' salmon fishers do. To maximise your chances of catching salmon on the River Dee it is always advisable to hire the personal services of an 'expert' to make sure you're fishing optimally and in the correct salmon beat holding areas. One of my main professional River Dee salmon guides notched up over 120 salmon to his own rod last season which was regarded as a nightmare season in Scotland (primarily due to the dreadfully low warm water conditions) so if you're considering taking advantage of a professional guide's 'midas touch' do not underestimate the calibre of professional provided via our services. 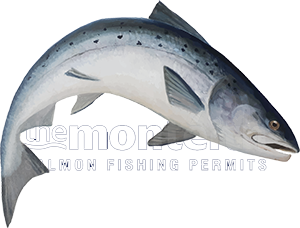 Follow this link for detailed information on how to book a River Dee salmon guide to significantly increase your chances of sub surface contact!